Solo_S14 Needs Help!! - Tuning Experts?? I'll bet that anyone who has followed the thread remembers the constant engine troubles that I've had. After losing a completely built engine at the end of '09, I installed and immediately melted a stock engine in the spring of 2010, then built the 3rd engine during the spring of 2010. To summarize the cars history since then, I've basically still been chasing the engine issues! When I lived on the East Coast (up until 2010), there was no dyno and no professional tuning in the province. Since then I have moved to the West Coast, found a dyno and a tuner, and logged some dyno time. I tried last spring, and again this spring, and both times the car has made consistent power (also consistent with the original motor in 2009), but I have had consistent and unexplained detonation above about 5750 RPM. Each time we tune great (safe) Torque and HP up to the 5750 RPM level, then the car begins detonating no matter what we do! I will begin with the results from yesterday's dyno session, then compare that to my dyno session last year, and the original data from 2009. (1) AFR's were almost flat, running 91 Octane beginning at about 11.8 and trailing to 11.2. The car made approximately 350 WHP flat from about 5700 RPM to 7000 RPM in the first pull below. (2) With AFR's flat and safe, and power flat from 5700 - 7000RPM we pulled timing from the top half of the map hoping to stop the detonation. We slowly backed out the timing......all the way down to 1-3 degrees advance at 19psi. If we were at the point of detonation, slowly backing out timing should have timed the burn and produced more power, but it constantly lost power and continued detonating all the way down to the 1-3 degrees advance level. Base timing on the car was 15 degrees checked with a non-advanced timing light while on the dyno. (3) Attempting to troubleshoot the problem, we changed the BKR7E plugs out and went from a 0.028" gap to 0.024" and went back to the original 7-10 degrees of timing advance. The car made 362 ft-lbs at 4580 RPM and 377 WHP at 5900 RPM. The exact same detonation problem continued from 5700 RPM to redline, but the car made more power with the timing added back into the picture. Something is not adding up. Sorry I haven't received the dyno graph yet, but here are screen shots from a video that I took to show peak TQ and WHP. I know that 7-10 degrees is a very conservative timing advance at the top end for these cars, and I think I should look into it further to find the problem. I know guys have mentioned that they run upwards of 18-20 degrees without issue, and even 25-30 degrees on higher octane fuel. To justify the hugely conservative number, I will post the timing tables from the car over a 5 year period. Before I get into that I want to say one thing......The dyno was loving the extra timing (making more power), so the only way to pick up on detonation was with proper head gear. We brought their master tech in to listen by ear in the engine bay while the tuner made a pull and he confirmed that it was definitely detonation, confirming the knock sensor / head gear noises. Now, in 2008 when the car was originally tuned I have no idea if the guys were using head gear to pick up on detonation. If they weren't wearing head gear with a knock sensor, and the car was making more power, they likely continued to add timing until it topped out, then backed it back to make it "safe"??? - Consistent area for a drop-off in power - possibly undiagnosed detonation issues? - When we finished it was much lower at about 2-8 degrees advance at 17 psi - Still detonating! - Consistent area of detonation from 5750 RPM to redline - Consistent issue! - At this point power typically dips, and we observe detonation no matter what we do with the timing! Last edited by Solo_S14; 03-06-2013, 10:34 PM. I guess that since it is consistently detonating above 5750 RPM, he figures that they ECU is not keeping up and sending out bad timing signals even though the ignition map is set so conservatively. Another theory that one of the shop guys had was that one cylinder had a bad coil, or a bad injector, and the wideband and dyno were not picking up on it. His other thought was that the igniter was bad, and basically causing the same bad timing signals above 5750 RPM. Can I get some opinions from some of the experienced tuners on this site, or if anyone knows somebody that may have good input, could you send them the link? At this point I am on the verge of toasting my 3rd motor (which actually had a leak down test of 98-99% across all cylinders before the dyno session last year - pretty proud of that! ). But in all honesty, I can't afford to go back on the dyno and withstand any further detonation. I don't think that the engine will handle more repeated abuse and I know that my wallet can't afford another unsuccessful dyno day. We've eliminated previous engine damage / hot spots with new engines, new plugs, and successful leak down and compression tests. We've eliminated the harness issue with a new harness that is now grounded to the engine. We've eliminated a bad tank of fuel possibility with 3 different tanks and consistently good AFR's. We've not seen any detonation below the magic 5750 RPM range - but have consistently seen it above that RPM. 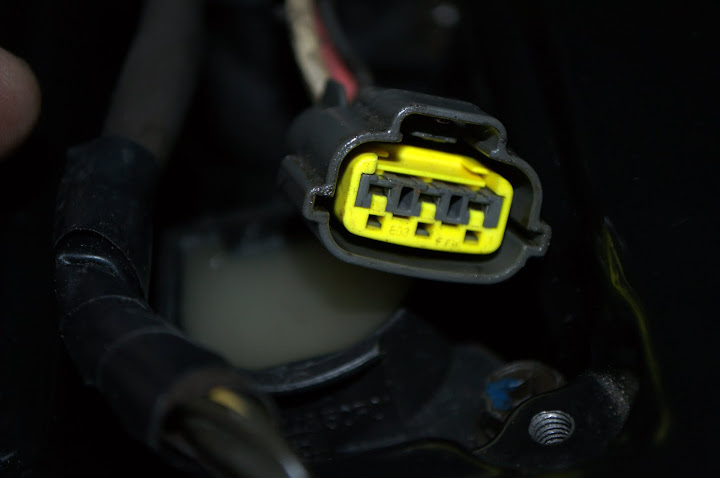 Options that have been proposed include a bad ECU, a bad igniter, bad coils, and a bad CAS. To test timing scatter / timing creep I have set all ignition tables to a flat 15 degrees and taken the engine from 1500 RPM to redline - the timing pins at 15 degrees, so I don't think that I am having a scatter / creep issue due to RPM range itself. This kind of discredits the theory of bad igniter / coil / ECU in higher RPM ranges, unless the added load / boost has something to do with it. I really need some help at this point, since it's stumped my tuner, his mechanics, and myself for a number of years now. Does anything pop out at you guys? If I can't find a solution, I almost have to give up on my current setup and start fresh - which I really don't want to do because I am so close and have so many years and dollars sunk into this setup. Enough of my rant and self loathing - does anybody have any idea's??? Thanks NRR, lets figure this out! Last edited by Solo_S14; 03-07-2013, 05:42 PM. Damage, is it always on one cyl or on multiple? If on one cyl, is it always on the same cyl? Ever shut the motor down as it detonates and read the plugs? Have you checked that all 4 cyl’s timing is stable from low to high RPM? Have you kept a timing light on when on the dyno and dialled into your target timing under boost and watched it in the in load situation? Have you got sufficient fuel flow? What plugs do you usualy run? My only comment is that I have an AEM EMS v1 for my KA, and just found out that my fuel issues are related to the ecu (plugged in the stock ecu and the car fired right up). So, I would not rule out the ECU being the culprit. Hopefully it's not. Good luck. You have documented this problem really well. The one good thing is that the problem is repeatable. If it was random and only happened at the track that would make you go insane. It will be easy to identify the fix when you come across it. Let me throw some things out there, maybe one will help. When I look at your "safe" maximum RPM with no knock it seems to relate to the octane of the fuel you used: 5700 for 91, 5800 for 93, 5900 for 94. Not much help from Mr. Octane but there is a pattern there. Is your turbo a 3271R still? Isnt ~400 HP about what their max output is? Forgive me since I am not too updated on SR power figures. Could that dip in boost mean you are maxing the turbo out or that the compressor blade is damaged? I see you have a large intercooler so intake temps should not be too high. Are you getting more detonation on later 'hot' runs? Are you using the Nissan CAS disk or the aftermarket 24 slot one? Even though AEM has said the EMS is now compatible with the stock CAS I have my doubts. But I don't have any supporting evidence on this one so it is just something you can "look into." Maybe this power level isnt high enough but... if you have a spare head you may want to duplicate what MazWorks does to their SR20 heads by removing the pads in the combustion chamber. These are not quench pads and are there to help add turbulence to the mixture around TDC. These are removed in the GTI-R and I have seen several shops removing them in their engines of different types from SR to KA to RB. You can have the chamber machined or do it by hand and CC check each chamber. You can see that the detonation is originating from under those pads as they hide the fuel/air mix in those regions from the flame-front. EDIT: Read a little more about your setup and had addition input. Last edited by p00t; 04-04-2013, 11:05 AM. +1 on which CAS disk you're running? I would assume the 24-1 AEM disk given how much troubleshooting you've done, but maybe it's been missed over the years. In addition, I would not rule out the EMS. I know the v1's had some injector driver problems for a long time, and some other circuitry issues as well. Have you also had someone run a timing light while you're doing a dyno pull? Might be interesting to see if you've got significant timing scatter. Can you also turn down the smoothing on the dyno? On Dynojets you can really see unstable combustion with the noise in the power on a smoothing of 0 or 1. What head gasket thickness are you running? Too thick may affect the "squish" area of the CC. Do you have an after market intake manifold? It would be interesting to see what EGT is doing at the collecter or by cylinder right as it gets to 5700 rpm at 19 psi. Does it do this at slightly lower boost (~14psi)? I have a V1 1602 box I will happily send you for trials. It is serial number 16 but I had AEM go through it last year. I don't want to sell it because long term I don't trust it, but it works fine. I 3rd the CAS request, but the 15 degree verification to redline seems pretty stable to me. Have we verified fuel pressure is stable at all RPM's/load...what is the max injector duty cycle? I had a motor I stuck together recently do a very similar thing on the dyno, it would fall over at about 6300 and pick back up right before redline...it persisted (similarly) regardless of timing or fueling...you could get it kinda happy for a second then it would come back...we tried lots of stuff...new coils, VQ35 coils, a splash of race gas.....no luck no change no nothing...so we set the rev limit low and let the kid go race it, he races ITE in SCCA here. When I tore the motor back apart for his next race outing I had all kinds of hell trying to get the retainers to let go of the keepers, and when I did the springs were VERY stuck to the retainers, Ti retainers BTW and annealed as far as i could tell. I reassembled with all new rockers, the same jimwolf S3HL intake cam and a new S3HL exhaust cam, stock retainers, brand new keepers, new OS exhaust valves and a set of (used) OEM springs that i verified were consistent (atleast to each other). what problem you say...I'm assuming it was valve float based on the condition of the springs retainers ETC, they seemed to have taken a hell of a pounding for 50 dyno pulls and 10 laps at big willow. improper hardness of the retainers? wrong angle for the keepers in the retainers? Tower, you are claiming the pads on the head are squish areas. However, for these areas to be squish they would have to be ~.040 clearance between the piston and the head at TDC. But none of the pistons on these Nissan DE heads mirror the head shape. So except for the flat part of the piston around the edge of the cylinder the dish has way too much clearance to be useful in quenching the fuel/air there. Look at the pistons then look at the head and think about it. 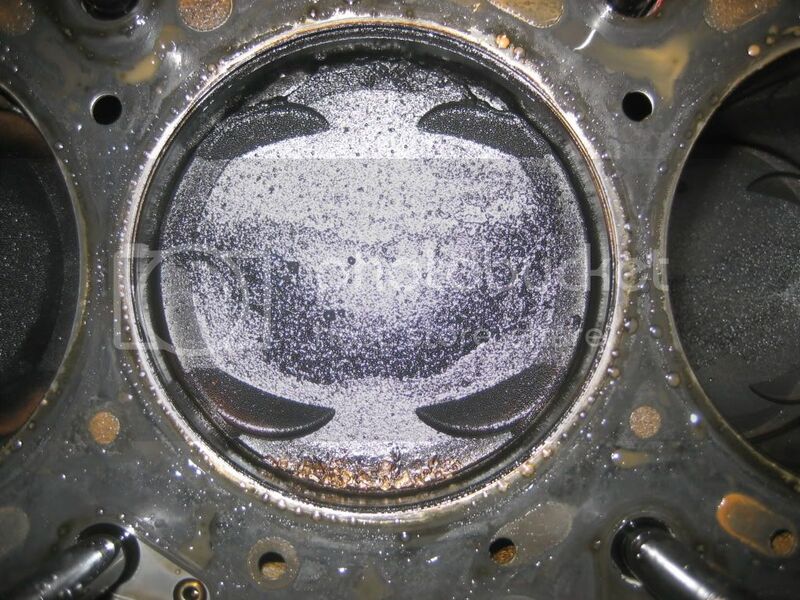 Backpressure induced exhaust reversion from valve float or camshaft timing/overlap could contribute to detonation. Higher rpms are usually where the pressure ratio tends to go above 1:1. What turbo, exhaust housing and manifold are you running? In all of my motors the perimeter of the Piston is higher than the center coming to within .005 of deck height. Headgasket thickness for nissans is usually in the 1mm (.040")range if you buy the right parts to start with...that sounds alot like Squish area to me. I think you need to broaden your understanding of what happens there and why. there is a greater percentage reduction in volume below that area of the head forcing the air/fuel into the center of the chamber, like all things in life it's not all black and white, you can't expect the same profile or percentage of bore area to be used as in a SBC or a 3 valve motor or a Hemi headed 993...it is the principal that matters and the results are the same. My point was that there is a lot of area between the head surface and piston that does not have the proper clearance for squish. The dish profile in the pistons does not match the head profile. Anywhere above the piston dish you have a distance that is greater than the head gasket thickness. The head surface is like a circle with 2 opposing ends chopped off. The piston dish is a circle. The profiles of these components do not match. So the head surface profile is there for other purposes than squish. It does nothing during high RPM to help knock. For high HP people it does the opposite. But you don't have to listen to me. Look at GTiR heads, look at what high HP SR people are doing. Why do you think they do this? Maybe you are missing something, or the whole point, I don't know. Nowhere have I read that for a quench area to be effective it has to be 360 degrees all around the chamber...the rest of the perimeter on the piston need not match the chamber profile, it is also utilized to add reinforcement to the top ring land, without it there would be degradation issues at a much lower cylinder pressure than currently. 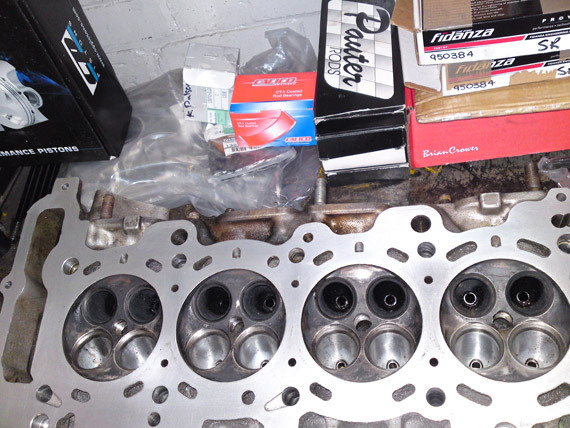 I have had in my hands several GTI-r heads I have in my possession 3 DE heads and 2 VE heads and numerous pistons, I know exactly what they look like and I just did the math for you in the previous post not sure what else you want from me. If you are happy with "the fast guys do it so it must be right" cool, great, super even until you have valid reasons don't come in touting how great something you don't understand is....did it occur to you that removing (what are commonly known as QUENCH pads) may be more for unshrouding of the valves???? Chevy gasket thicknesses are similar to ours and the standard SCB has a piston to deck height of -.020 resulting in a .060 clearance in the squish area, nobody argues that that makes it not-a-squish area, optimal effectiveness, no, but it still serves a purpose. How exactly do you propose people make up the huge difference in chamber volume after removing the QUENCH pads? Mazworx doesn't seem to indicate the volume change but they are the only ones I see offering corrected CR pistons sets based on their chamber machining process. Head flow - now that is good. I think Mike might be right on this one.